It targets your upper chest, deltoids, and triceps and assists in improving upper body strength. It stretches your chest muscles more than the flat bench press and thus needs a longer range of movement for executing the workout. Squeezing the weights tightly while doing the exercise helps in enhancing your shoulder stability. 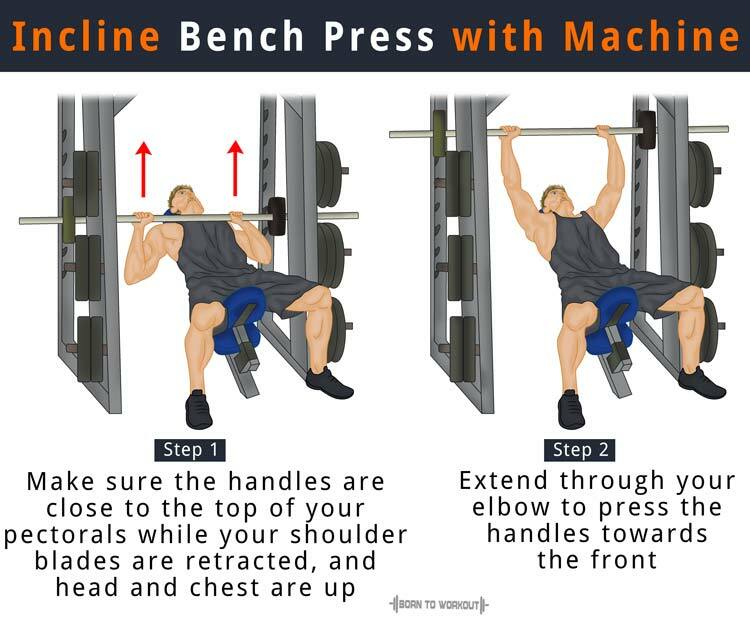 It is thus safer and friendlier for your shoulders than other variations of the bench press. Place the barbell on a rack at an appropriate height for your training. Assume a lying position on the incline bench, which is kept at 30-45 degree angle. Make sure your feet are flat on the floor, your back is arched, and the shoulder blades are retracted. Grab the barbell using a medium, overhand (pronated) grip, and remove it from the rack to hold it directly above your chest with the arms extended and elbows locked. It is your initial position. Tighten your lats and unlock your elbows to lower the weight gradually until it touches the sternum (breastbone). Maintain control when the weight descends and do not let the bar bounce off your chest. Pause for a second and then press the bar back to the starting position by extending your elbows and driving through your hips. Do the recommended number of reps. Lie back on the incline bench and keep two dumbbells atop your thighs using a neutral grip, letting your palms face each other. Push the weights up with your thighs so that you can lift the dbs and keep them at your shoulder width. After raising the weights, rotate your wrists so that the palms face away from you. It is your initial position. 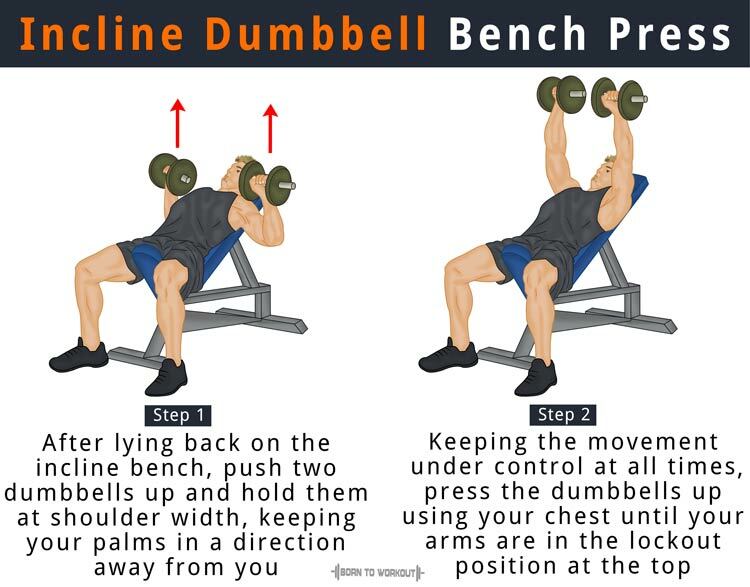 Keeping the movement under control at all times, press the dumbbells up using your chest until your arms are at the lockout position at the top. Pause for a few seconds and then gradually lower the dumbbells to the starting position. The time taken to bring the weights down is about twice it takes to raise them. Perform the required number of reps and when the repetitions are completed, place the weights back on the thighs and then release them on the floor. 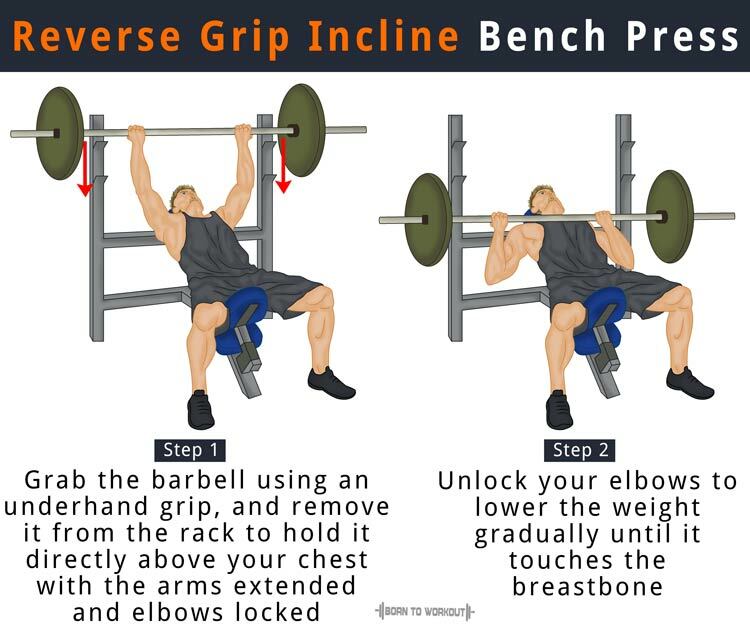 This variation of the incline bench press is performed the same way as the traditional incline barbell bench press except the barbell is held using an underhand (supinated) grip so that the palms are facing toward you. 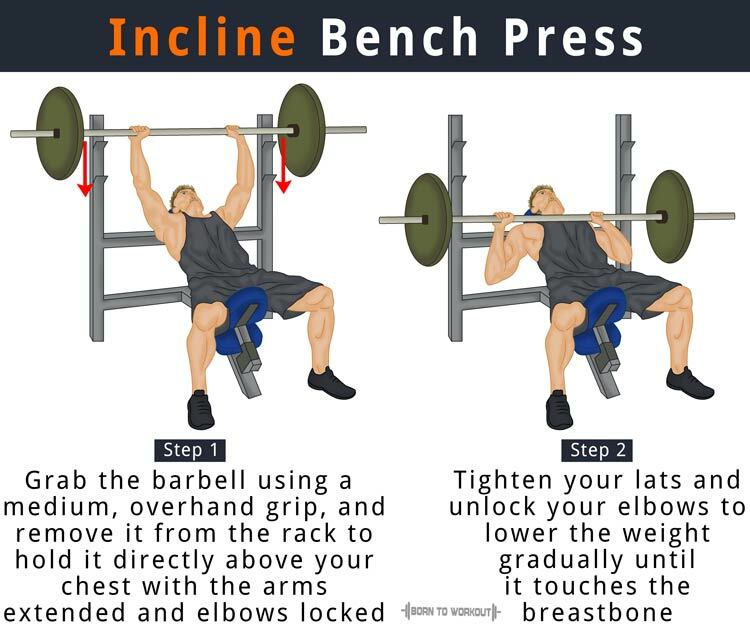 Also known as leverage incline chest press, this variation is performed using a smith machine. Load weight on the machine and adjust the height of the seat. Before starting the movement, make sure the handles are close to the top of your pectorals while your shoulder blades are retracted, and head and chest are up. It is your initial position. Extend through your elbow to press the handles towards the front. After pausing for a second at the top position, return the weight above the initial position. Return the weight to the stops once you perform the entire set. Maintain a neutral spine position and make sure that your neck is not hyperextended. Use different grip width – people with longer arms may need to perform the exercise using a wider If you want to activate your triceps more then hold the bar with a close grip. Your shoulder blades and glutes should touch the bench all through the movement. Try to pull the bar apart or bend the bar, as it will help in activating the intrinsic stabilizer muscles in the shoulder.